Many seaside Cape locations are known for their history as fishing villages or farming communities, as whaling hubs or home to quirky local industries, as summer playgrounds or, in our case, as the cradle of modern marine science. Only one town can claim all of these. Woods Hole was first used as a fishing grounds by the Wampanoag people. Then in 1602, Bartholomew Gosnold first set foot on land that would later bear his name. By the late 1600’s, Europeans began to firmly establish themselves, thirteen families each taking 60 acre plots around Little Harbor to raise mostly sheep and crops. 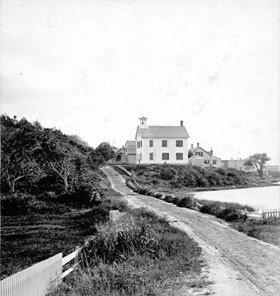 By the early 1800’s, Woods Hole had become a center of the booming whale trade. At the industry’s peak, nine whaling ships were docked at the Bar Neck wharf in Great Harbor, supporting a thriving local economy of chandlers, outfitters, candlemakers and processors of oil and whale bone. When the whaling business waned, Woods Hole became home to a fertilizer factory called the Pacific Guano Works on what is now exclusive Penzance Point. The company evolved from an importer of quality South American guano to a chemical processor, working with sulphur from Italy, nitrate of soda from Chile, potash from Germany, local hauls of menhaden, and schooner loads of phosphorus from South America and the Caribbean to supply a heavy demand from growers around the country. 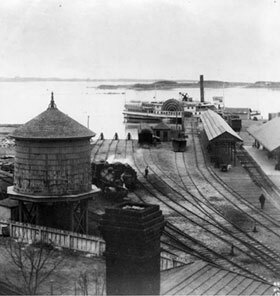 The need to transport thousands of tons of fertilizer brought the railroad — crucial to later development — all the way south to Woods Hole from Boston. By the late 1800’s the Guano Works had closed, but a new industry had already begun to take root. 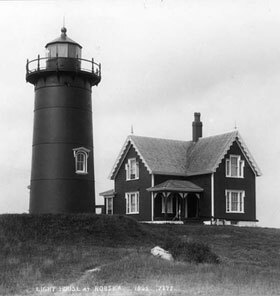 The federal government realized that marine populations needed to be studied and managed to protect fishing stocks and the markets that depended on them, so they established the U.S. Commission of Fish and Fisheries, which came to Woods Hole in 1871. Scientists were drawn to waters kept clean and clear by strong local currents, to the deep water anchorages perfect for research vessels, and to the central location, midway along the most heavily fished stretches of New England. Science begat science, and in 1889 the world renowned Marine Biological Laboratory was founded, since then providing a full or part time home to well over half a hundred Nobel Prize laureates. A few decades later, the Woods Hole Oceanographic Institution was created, spawning talent and technology that would blaze new trails across the seas, discovering the wreck of the Titanic among many seminal scientific achievements. At the same time, a different kind of discovery was changing the Cape. 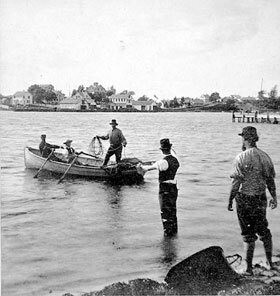 Beginning in the mid 1800’s, people were venturing toward our harbors and dunes in search of recreation. This trend gathered speed on the wheels of America’s love affair with the road, and continues today. Each year vacationers swell the population of Cape Cod from 220,000 in winter to well over 600,000 in summer. Woods Hole is no exception. History is still everywhere in Woods Hole for people to touch. Original captains’ houses line the main streets, and most businesses operate in buildings erected in the 1800’s. Fishing boats still tie up at the town dock. The Marine Biological Laboratory is headquartered in the old stone building that once housed the candle works, and its surrounding campus provides an architectural history survey from vintage buildings of clapboard and red brick to ultramodern steel and glass. The railroad beds first laid to haul fertilizer and early tourists now carry the beachside Shining Sea Bikeway, one of the most beautiful paths for cycling or hiking anywhere. Antique sail and power boats dot the three harbors which describe the village. The Woods Hole Oceanographic Exhibit Center has state of the art, child-friendly displays allowing young hands to play over actual craft that once explored ocean floors. Strollers will find street signs with names that are legend in marine science: Agassiz, Baird and Hyatt, to name a few. The NOAA Fisheries Service, a descendant of the original fisheries commission, operates the Woods Hole Science Aquarium, featuring touch tanks for children and regular seal feedings. And Woods Hole’s own Historical Museum offers a vintage scale model of the village as well as rotating exhibits of photographs, maps and other artifacts. Visitors can explore on their own, or be guided by an audio tour created by the Historical Museum. You can navigate to the site on your smartphone and listen to the tour while you walk, following a map available at the museum. Wherever your visit takes you, trust that you’re retracing steps taken over and over for centuries by people like you, drawn to the beaches and breezes and bounty of a singular seaside destination. Want to learn more . . . visit the Woods Hole Museum at 579 Woods Hole Road.